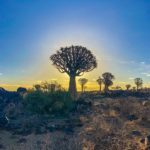 What is Namibia Like? Namibia is breathtakingly beautiful, vast, and empty. It’s a great off the beaten path holiday destination, the locals are friendly, it’s safe, and tourists are almost non-existent in some places. Travel in Namibia is a great time. 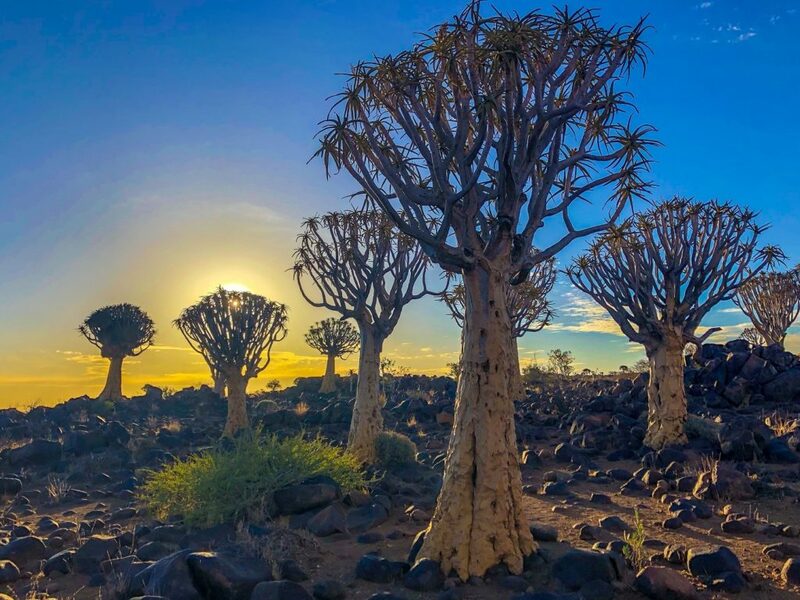 Quiver tree forest near Keetmanshoop, Namibia. It’s the Perfect First Splash into Africa. Ever dreamed about African travel but didn’t know where to start? Travel in Namibia! Screw Botswana: it’s expensive and teeming with tourists! Many people think of Africa as a country (it’s not) riddled with AIDS, sketchy thieves, and Malaria. This can be true of almost anywhere on the planet (hate to tell you this, but there’s AIDS in The States, too!). I think a lot of people opt for the overland tours and pre-arranged itineraries “just to be safe”, but that is so not necessary for Namibia! You can easily do an off the beaten track holiday here. And, I think, you’ll enjoy yourself more. 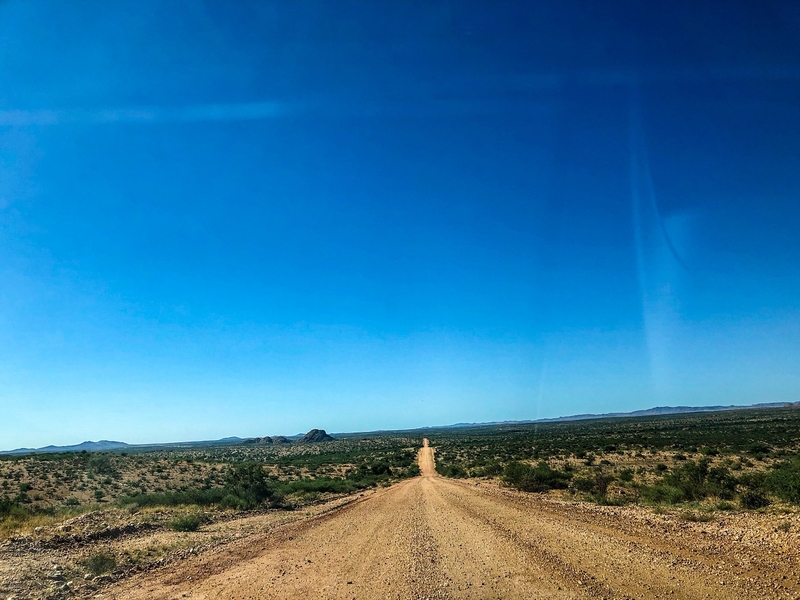 There are some bumpy roads and some seriously empty places (bring water and food in case you get stuck for a few hours…) but otherwise travel in Namibia is not too much worse than travel in any other “western” style country. Busting the crap out of our calf muscles climbing this sand dune. Namibians speak English! Woohoo! Oh, they also speak German, too! You can get directions, order food, talk about the weather and even eat delicious German cuisine. 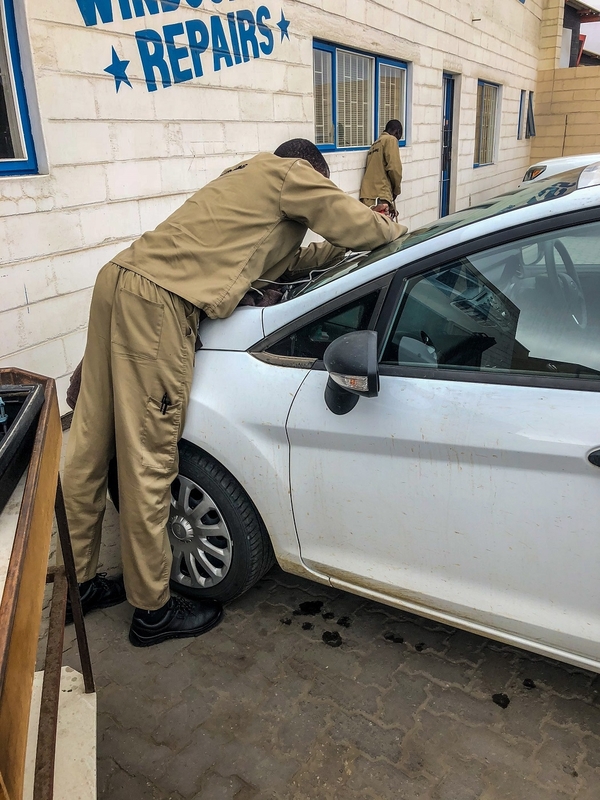 Petty theft is not really a thing to worry about in Namibia outside of the major city centers. Your biggest concerns will be based around your car: flat tires, cracked windshields, busted suspension coils, running out of gas, and getting stuck in sand are very common problems on the road. Namibia has so much to offer the adventure seeker, the wildlife enthusiast, the star-gazer, the camper, the explorer and even the lazy. 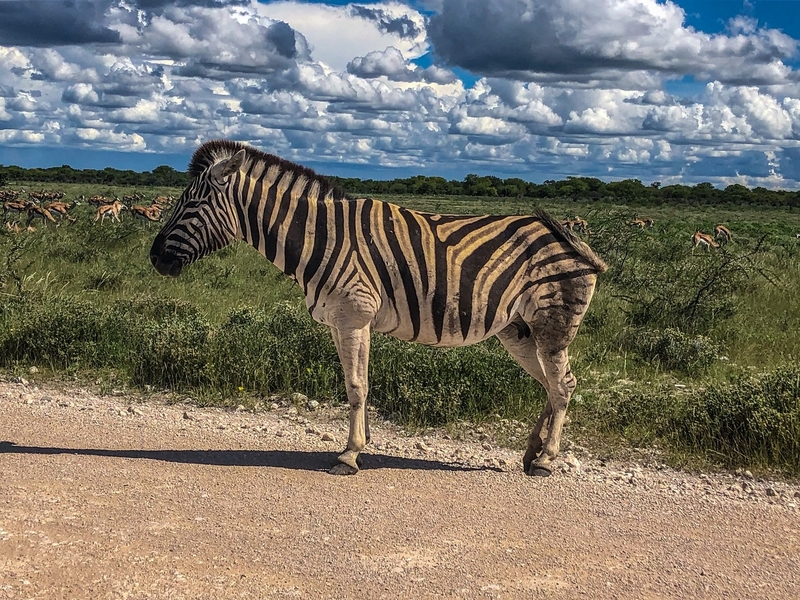 Etosha National park boasts elephants, rhinos, cheetahs, giraffes, zebras and much more. You can go to the desert to climb sand dunes at sunrise. There are incredible dark skies to watch the stars. Rivers to swim in that are full of hippos and crocs! You can check out massive canyons and empty parks that will stretch on into the horizon. Truly, this country feels untouched, pristine, and away from everything. It’s perfect. Namibia is an Off the Beaten Track Holiday. Recently, Mr. Trump called Namibia “Nambia” and referred to African countries as “shitholes.” He couldn’t have been farther from the truth (or more embarrassing, but that’s a different story…). 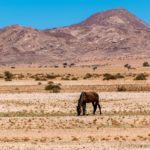 Very few people know about Namibia (even the president of the USA, for that matter!) Because this is so not well-known (outside of Germany that is) you will not be competing with hordes of tourists. 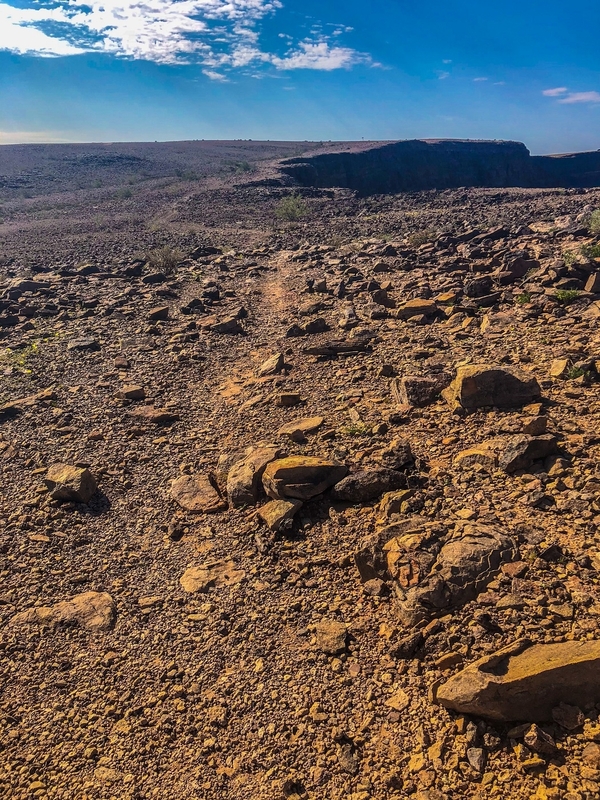 In fact, you’ll likely be the only person on that canyon ledge or driving along that gravel road in the middle of the beautiful park you’ll be cruising through. 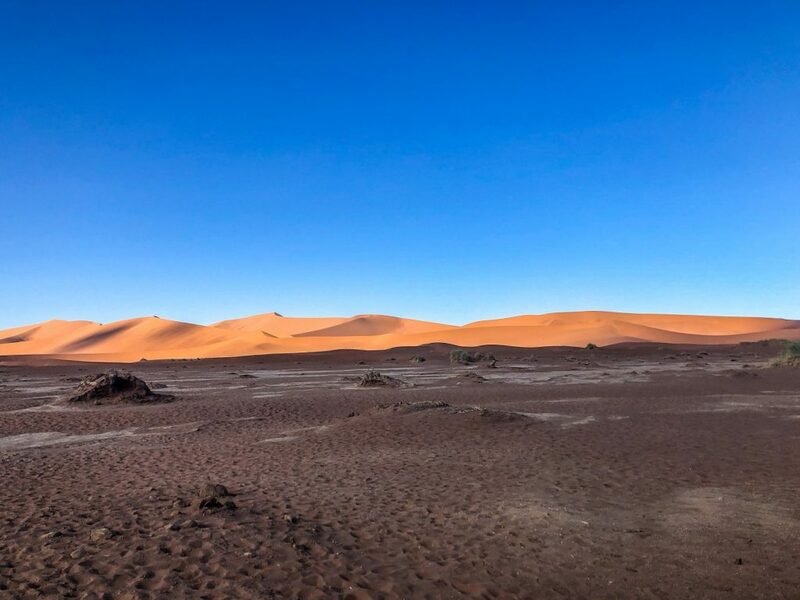 Most people will have never heard of Namibia and travel in Namibia means a chance to break free of well-trod paths and sit in a space of your own. A walk along the Fish River Canyon Edge. It Feels Like No One Lives Here. Namibia is one of the least densely populated countries on the planet. As a result: it’ll be empty road for hours. No cars. No people. No houses. Well, maybe a zebra. Travel in Namibia is all about the solitude of the nature around you. If you’re looking for city life and people: you’re in the wrong place. Get used to sights like this. I hate to tell you this, but Namibia is not for the shoe-string traveler. We did our damn best to keep our travel expenses to a minimum while traveling around for a month and it was hard. 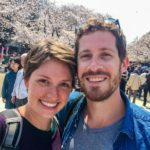 There are precious few hostels (and you’ll only find them in city centers), lodges are mighty expensive, and gas will really start to add up. If you’re not willing to part with the $100-200 dollars per night to stay in a lodge, prepare thyself for camping. You can read more about where we stayed here. 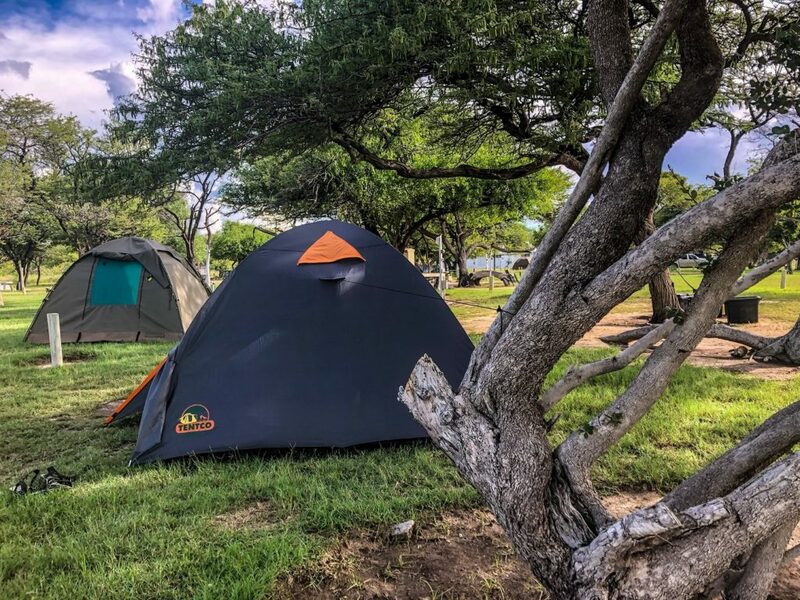 Generally, camping will cost between $20-50 dollars per night for a couple. Renting a car will cost about $30-50 bucks a day for an SUV, about $100 for a fully loaded 4×4 camper van. Entrance fees will run you between $5-20 bucks, depending on the park. Dinner will cost about $10-15 dollars per person in a restaurant. 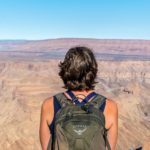 Travel in Namibia can be done on a budget, but not a small one. Our tent at a campground. You’ll Need to Rely on Yourself. There is no public transportation easily accessible to tourists. Other than an overland tour, you’re going to have to rent a car and do A LOT of driving. We wrote more about how to stay safe and other tips here. Renting a car is your best option, but if you can’t drive stick shift on the right side of the road (they drive the same side as the British!) you’ll need to get on a tour. 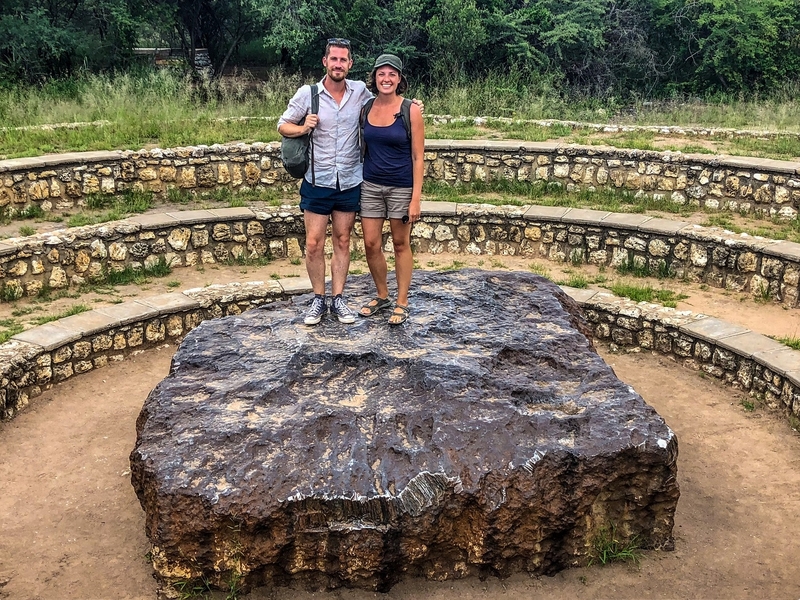 Standing on the Hoba Meteorite. The Internet is Almost Non-Existent. Sorry, but if you like connecting to Facebook at the end of the day you’re gonna be very sad. There were precious few times we could connect to the internet or even get data on our phones. 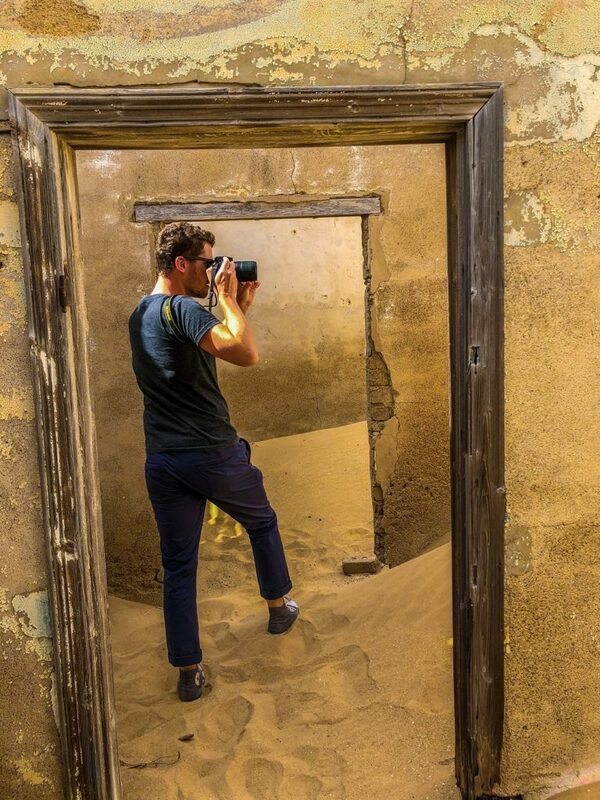 Jackson got a Namibian SIM card which only worked in the towns and cities (that made getting stuck in sand in the desert for a few hours REALLY fun because our phones didn’t work…). WiFi is slow and expensive at camps. Bring a lot of books or a kindle. I like to think that if you’re looking for a truly off the beaten track holiday, a destination that will cut you off from the internet is a good start. I liked that I couldn’t get on Instagram for a while. I felt more in the moment. No internet? 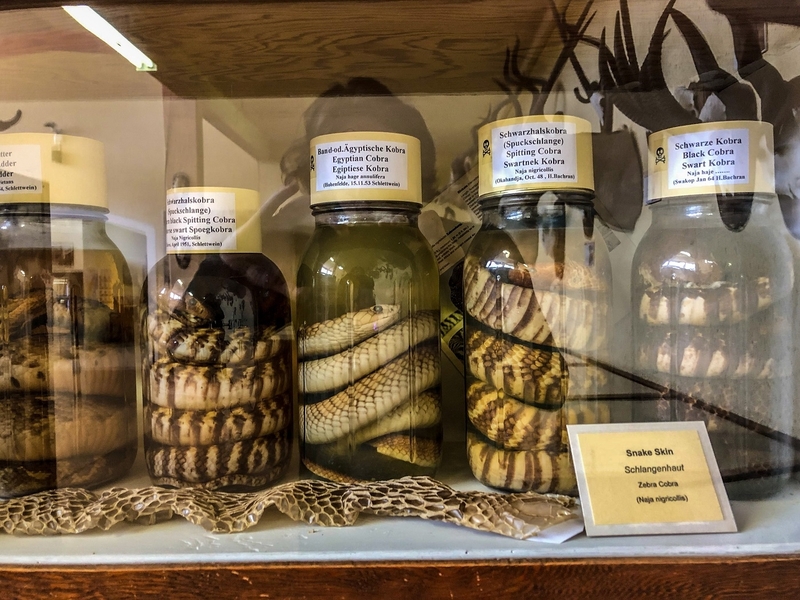 We went to the Swakopmund Museum for a little afternoon entertainment. You Can’t Trust what Google Says. Don’t rely on google to help you. It is surprisingly out of date about what roads exist, padstals (farm-to-table restaurants) you can get food in or even what towns exist on the map. We used the “MapFactor Navigator” App (free!) which was invaluable to us. You can download the map beforehand and it acts like a GPS even when you don’t get signal (which is most of the time!). 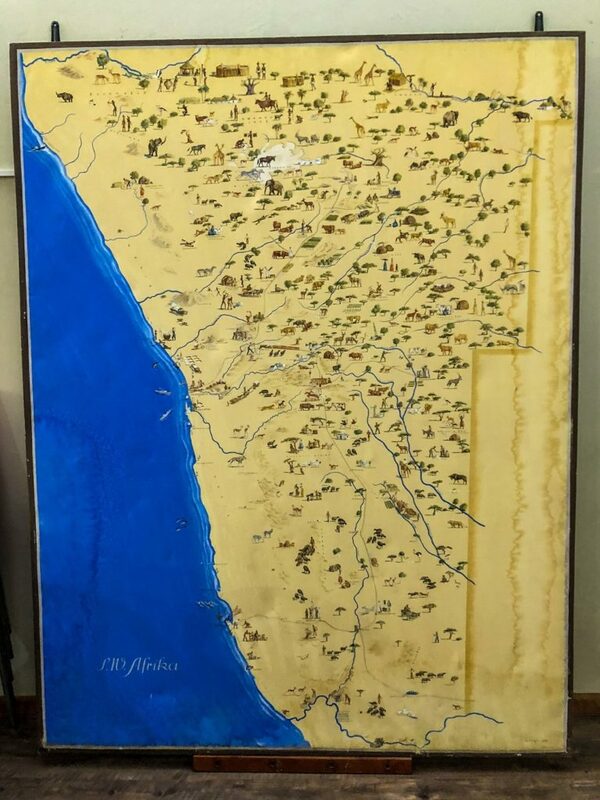 You’ll likely get free Namibian maps at the borders and in the cities, which can also be a big help. Travel in Namibia will leave you looking at a map a lot! Hope you still know how to read one! Namibia’s Pixelated Unless you have a Zoom Lens. iPhone pictures will not do your trip justice. Zebras will cross the roads and get close sometimes, but usually hang out in watering holes way over *there* and your only hope of capturing that is with a zoom lens. If you’re gonna come down here, come prepared! Because this country is so quiet, it’s really easy to see animals here. We loved looking at them in Etosha, especially. 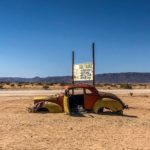 Travel in Namibia is Impossible Unless you get Yourself Some Comprehensive Travel and Car Insurance. You will get a flat tire. You will crack your windshield. You will need insurance to help you out. Just accept it and enjoy yourself. Getting that first crack in our windshield fixed. Namibia’s Full of Varying Weather. We visited in the shoulder season of March (the rainy season). In the desert that means a whole lot of nothing because you’ll have blue skies and hot hot sun no matter what time of year you’re there. In Caprivi, in the North, it meant tons of thunderstorms. On the coast, it meant a lot of wind and mist. In the rest of the country it was hot, dry and beautiful. Rainy season also means a lot of green growth, plentiful watering holes and fat animals. You won’t see as many animals as you would if you were to go during the dry season, but you will see lush forests, full rivers, and tons of birds. I hope you are. So many people will overlook travel in Namibia simply because they’ve never heard of it. Botswana has got Prince Harry’s approval, so it’s overrun with tourists and is very expensive. I’ve got so many stories to share of how wonderful this country is. I hope one day you get a chance to see it for yourself. Truly, an off the beaten track holiday never looked as cool as this, in my opinion. 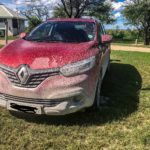 If you’re curious about other off the beaten path holiday ideas, feel free to look at our travel in South Africa and Botswana. 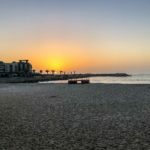 We loved our 2-month road trip in Southern Africa. Can I hop into just box the next time you travel. I love your post, you should consider coming to Nigeria. Nigeria looks so cool. We recently watched Anthony Boudain’s show on Lagos and it looks like one helluva city to see! We want to visit more of Afica; it’s just so big and there is so much to see!! This looks like a trip though for sure that you’ll just have to accept whatever comes at you and deal with it. I would absolutly loveeee to see the Wildlife ! Thanks for sharing! Yeah, that was embarrassing. Nambia? C’mon. I hope you get a chance to go! You’d love it. I have been dying to go to Africa. I didn’t realise they spoke so much English in Namibia. That would certainly be useful when Google Maps lets you down (which it sounds like it will). Yes! It’s great! And yes, make sure you bring a physical map. Cool! I wonder what village? There aren’t many there! Great! I hope you get a chance to go! Namibia looks great! It is one of the road trips you do not hear about often but as proven here those are often the best ones! 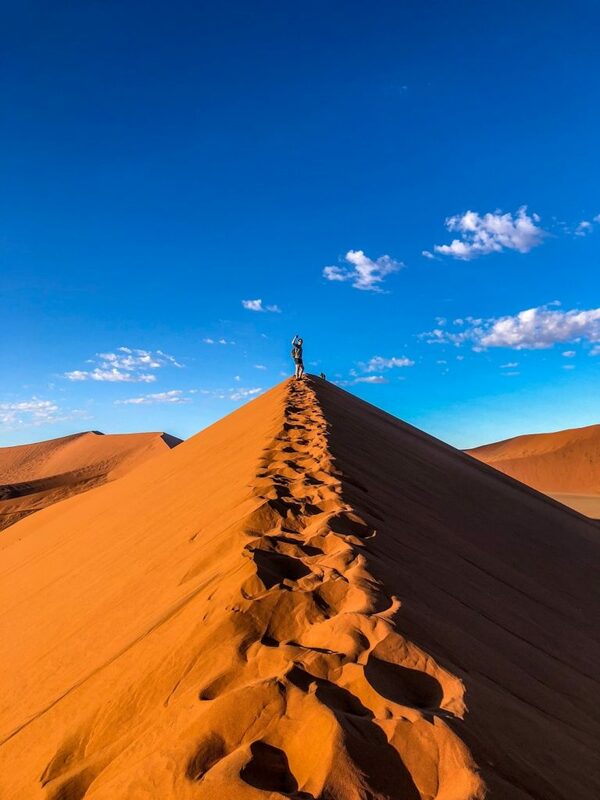 Namibia looks like a great place for the more adventurous to visit! Yes! I wouldn’t recommend someone who has never left their home country to go, but if you have a few trips under your belt this would be the place to go! The wildlife there is unbelievable. Great post. Namibia’s one of the places I’ve always wanted to see and I’ve heard it’s becoming the new South Africa. I didn’t expect it to be so expensive, but I don’t think that will stop be getting over there one day. This is now bookmarked for the day we do. Great! I am happy to inspire you and I hope these tips help you if you go! It’s a great place to see! We know many people who have traveled to Namibia lately and they all loved it. They also said that it’s actually not a cheap destination, but worth it the experience. Although we’re more into cultural travels and less into wild animals and camping, we might want to go there too someday. I hope you get a chance to go! But, yeah, your friends are right: it’s not cheap. Really helpful advice and I love your photography (especially the zebra!). Thanks for sharing.